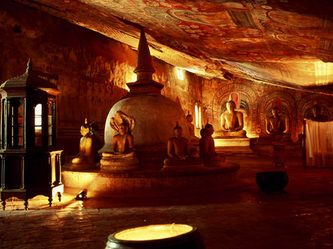 The caves of Dambulla, like the mihintale caves, were occupied in very early times by Budd¬hist hermits. The antiquity of this place has been authenticated by the presence of pre-Christian inscriptions in Brahmi character immediately below the drip-ledge of the central cave. One of these inscriptions records: "Damarakita teraha lene agata anagata catu disa sagas dine. Gamani abaya rajiyahi karite" (The cave of the Elder Dlmamma-rakkita, given to the Community of the four quarters, present or future. In the reign of Gamani Adhaya.) The shape of the letters of all the short inscriptions in Brahmi form at Dambulla is distinctly those of the first century B. C, At that time there was only one king known as Abhaya, also known as Vattagamani Abhaya (89-77B. C.). this leaves no doubt that the king Abhaya referred to in the above quoted inscription Vattagamani Abhaya. Dambulla became a popular place of residence of Buddhist monks at least from the reign of this king. 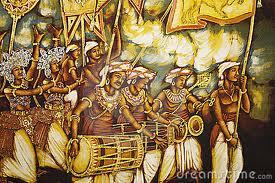 Vattagamani Abhaya is one of the few kings of ancient Sri Lanka whose name and fame are not dependent on the written records. To him are credited by the common people of the country tile numerous caves with drip-ledges which were abodes of Buddhist monks in ancient days. As we have seen, one or two of these caves like Dambulla do, in fact, bear inscriptions with the royal name which is attributed to him. 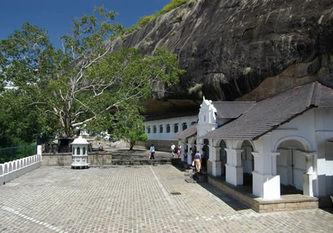 According to tradition Vattagamani Abhaya, who fled from his kingdom, when it was invaded by south Indians, was helped by the monks residing in caves like Dambulla. 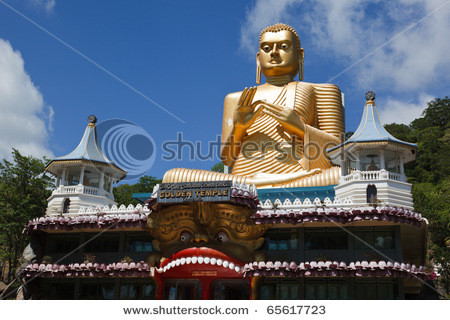 The Mahavamsa records that the Buddhist scriptures were first committed to writing by Buddhist monks at Aluvihara in the reign of this king. 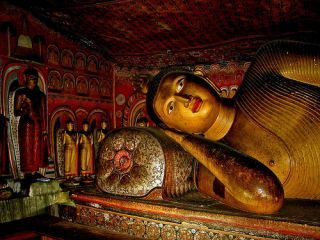 This can be taken as substantial evidence to show that great caves like Dambulla and Aluvihare in the central part of the Island were residing places of Buddhist monks during this early period and were also patronized by the kings of Anuradhapura. The rock of Dambulla is the centre of a Buddhist cave-temple complex established in the 3rd century B.C. and occupied continuously to this day. Its location has marked a transportation node between the Eastern and Western Dry Zones and between the Dry Zones and the central mountains throughout the history of Sri Lanka. The cave-temple complex is established on an inselberg or erosional remnant of importance in the study of the island's geological history. The 25 hectare site proposed for inscription also includes evidence of human occupation going back to the prehistoric period, including the recently excavated megalithic cemetery at Ibbankatuwa. The site has been in continuous use for over 22 centuries, when it was occupied by a Buddhist monastic establishment, following the arrival of Buddhism on the island. Remains of 80 rock shelter residences established at that time on the site have been identified. 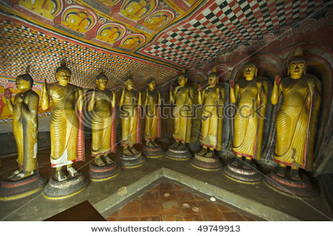 Likely in the 1st century B.C., the uppermost group of shelters on Dambulla's South face were transformed into shrines. These transformations continued and were intensified between the 5th and 13th centuries: cave-temples were extended into the sheltering rock, and brickwalls constructed to screen the caves. By the end of the 12th century, with the introduction by King Nissanka Malla of sculpture to the caves on the upper terrace, echoing the rock carving that had preceded it, the caves assumed their present general forms and layout. The next major phase of development took place in the 18th century when following a long-standing tradition, the upper terrace was restored and refurbished. All of the painted surfaces within the caves were painted or overpainted in a style characteristic of the Kandy school of the late 18th century. At that time, the modest Buddhist figures in the caves were repainted, maintaining original details and iconography; the fronting screen walls were rebuilt and roofed to form an outer veranda. Throughout the 19th century, following the loss of royal patronage in 1815, periodic repainting of sculptures and deteriorating surfaces continued. In 1915, thanks to the efforts of a local donor, cave no5 was entirely repainted. And in the 1930's, the veranda was rebuilt incorporating a mixture of European and Asian detailing, and the complex's entrance porch was reconstructed in a conjectural 18th c. style. Dating back to the 1st Century BC, this is the most impressive cave temple in Sri Lanka. It has five caves under a vast overhanging rock, carved with a drip line to keep the interiors dry. In 1938 the architecture was embellished with arched colonnades and gabled entrances. Inside the caves, the ceilings are painted with intricate patterns of religious images following the contours of the rock. There are images of the Lord Buddha and bodhisattvas, as well as various gods and goddesses. The temple is composed of five caves, which have been converted into shrine rooms. The caves, built at the base of a 150m high rock during the Anuradhapura (1st Century BC to 993 AD) and Polonnaruwa times (1073 to 1250), are by far the most impressive of the many cave temples found in Sri Lanka. Access is along the gentle slope of the Dambulla Rock, offering a panoramic view of the surrounding flat lands, which includes the rock fortress Sigiriya, 19kms away. Families of friendly monkeys make the climb even more interesting. Dusk brings hundreds of swooping swallows to the cave entrance. The largest cave measures about 52m from east to west, and 23m from the entrance to the back, this spectacular cave is 7m tall at its highest point. Hindu deities are also represented here, as are the kings Valgamba and Nissankamalla, and Ananda - the Buddha's most devoted disciple. Within these shrine rooms is housed a collection of one hundred and fifty statues of the Buddhist Order and the country's history. These statues and paintings are representative of many epochs of Sinhala sculpture and art. The Buddha statues are in varying sizes and attitudes - the largest is 15 metres long. One cave has over 1,500 paintings of Buddha covering the ceiling. The first cave is called Devarajalena, or "Cave of the Divine King." An account of the founding of the monastery is recorded in a first-century Brahmi inscription over the entrance to the first cave. This cave is dominated by the 14-meter statue of the Buddha, hewn out of the rock. It has been repainted countless times in the course of its history, and probably received its last coat of paint in the 20th century. At his feet is Buddha's favorite pupil, Ananda; at his head, Vishnu, said to have used his divine powers to create the caves. The third cave, the Maha Alut Vihara, the "Great New Monastery," acquired ceiling and wall paintings in the typical Kandy style during the reign of King Kirti Sri Rajasinha (1747-1782), the famous Buddhist revivalist. In addition to the 50 Buddha statues, there is also a statue of the king. The fourth and fifth caves are smaller; they date from a later period and are not of such high quality. A small Vishnu Devale between the first and second caves attracts many worshipers.